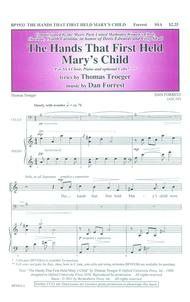 The Hands That First Held Mary's Child (SSA) composed by Daniel E. Forrest Jr.. For SSA choir. Sacred, Christmas. Octavo. 12 pages. Published by Beckenhorst Press (BP.1933).Cello part available as BP.1928A. Score and orchestral parts available as BP.1933B.